It’s no secret that sweets make ideal accompaniments for many cheeses — chocolate, jams and honey are popular condiments on a cheese board for a reason. 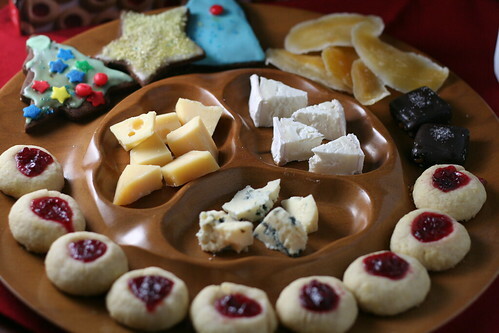 So why not take the next logical step and add Christmas cookies for the ultimate holiday cheese board? I made lingonberry tart cookies, perfect for balancing the fruity yet tangy bite of the Rogue River blue. 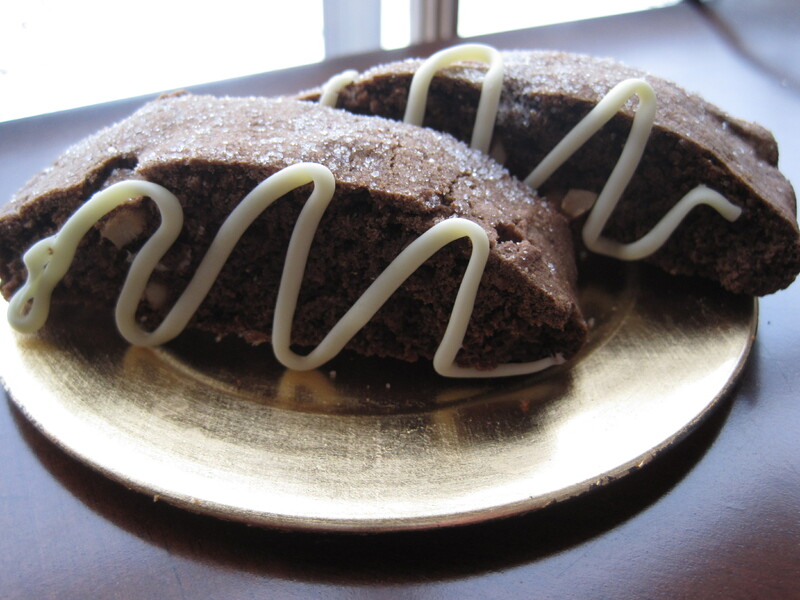 The sweet Prima Donna gouda tasted even sweeter after a nibble on a gingerbread cookie. Earthy yet mild Cabra de Cana (a Spanish version of Rebluchon) was a creamy palate refresher, and the board is rounded out with some dried fruit and chocolate salted caramels (Kingsbury Confections, a local treat). Jill makes white chocolate-coffee-cashew biscotti that is perfect with aged gouda or a decadent triple-cream. I’m still pondering what to match with my cranberry-pistachio biscotti, but I might go creamy there too. I plan to set these out on Christmas day to nibble on with coffee and perhaps a champagne cocktail in the afternoon. We hope you have a cheesy holiday — and if you’d like to share your holiday cheese board, please send a picture to dccheeseATgmailDOTcom or Twitpic to our attention @100cheeses. We may post the best ones here. Merry Cheesemas! The thought of reviewing the “Best of Show” winner from the American Cheese Society awards is, honestly, a little daunting. After all, you’ve surely already read all about this seasonally-produced, leaf-wrapped, buttery blue from central Oregon. You probably have heard of Rogue Creamery, one of the West Coast’s most celebrated cheese producers. 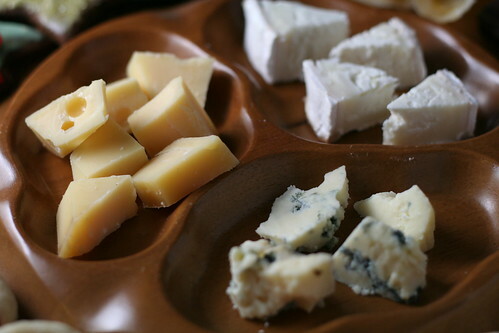 (Did you know they were the first to export American raw-milk cheese to Europe? That they test every batch of milk to ensure it’s antibiotic and growth-hormone free? 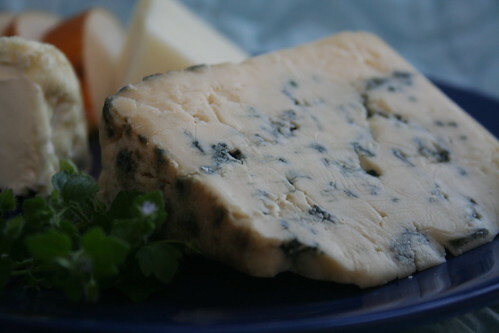 That the founder, Tom Vella, spent three months studying blue cheese making in Roquefort, France?) 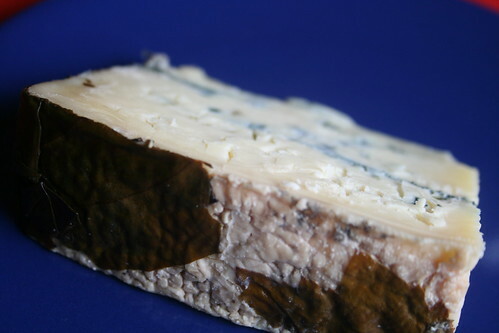 Honestly, I could describe Rogue River Blue in one word: yum. But perhaps you’d like a little more description. This particular cheese is a testament to Oregon’s terroir. It is made only for a short window in the fall (during the autumnal equinox and winter solstice) when the milk is at its highest butterfat content. The cheese is wrapped in Syrah grape leaves from nearby Carpenter Hill Vineyards; the leaves are first macerated in locally-made Clear Creek Pear Brandy. The cheese is aged in caves built to resemble the famed caves of Roquefort, allowing natural molds of the Rogue River Valley to ripen the cheese. 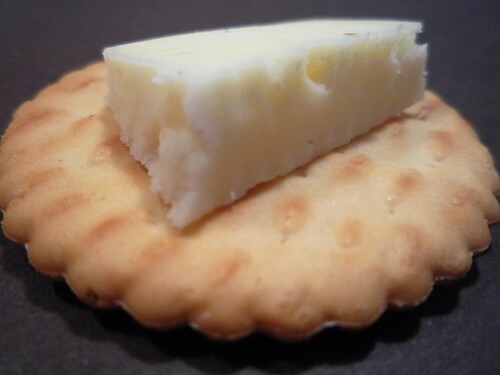 The resulting cheese develops a wonderful, complex flavor. 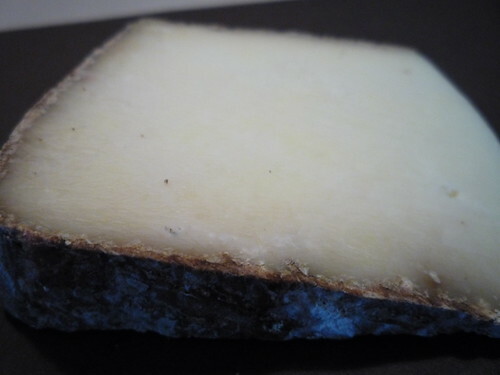 It is buttery, silky and rich, sweet with soft fruit flavors and a slight smokiness. Not having any Clear Creek on hand, I tasted this with a sip of my post-dinner Dark n’ Stormy. Maybe not a perfect pairing, but the ginger was an interesting match. Of course it goes without saying that a fresh pear will make a lovely companion for a hunk of this blue. By the way, Rogue River Blue’s 2009 release started shipping yesterday, so head to your favorite local cheesemonger … right now! The American Cheese Society award winners were announced last night at the 26th annual conference and competition in Austin, Texas. This year saw a record-setting 197 producers from 32 states, Canada and Mexico, and the judging committee had the enviable task of tasting 1,327 cheeses and dairy products to determine this year’s winners. The “Best in Show” award went to…. Oregon’s Rogue Creamery* for Rogue River Blue! In second place is Cowgirl Creamery‘s Red Hawk (CA). Third place is a tie between Consider Bardwell‘s Rupert (VT) and Carr Valley‘s Cave Aged Mellage (WI). You can view the complete results here (link is a pdf file). 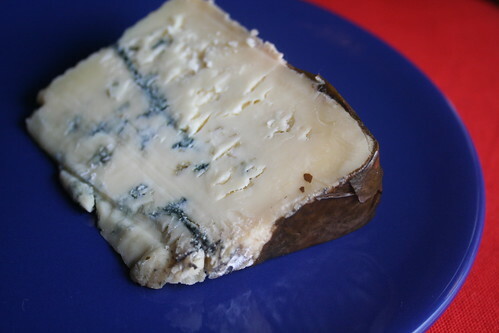 Unfortunately Rogue River Blue is a seasonal cheese; we tasted the last of the 2008 batch at the Fancy Food Show in June, you’ll have to wait till the new batch is released in October and make due with another of Rogue’s wonderful blues in the meantime. Cellars at Jasper Hill/Cabot Clothbound Cheddar was knocked out of first place in clothbound cheddars (aged less than 12 months) by Vermont upstart West River Creamery’s Cambridge Classic Reserve. Jill can claim a large number of winning Wisconsin cheeses as local to her, but we’ll also note that Hidden Springs Creamery (WI) Farmstead Feta took 1st place in Feta, sheep — not something you typically associate with Wisconsin cheese. Surfing Goat Dairy of Maui, which Jill wrote about earlier this year, placed 3rd in the flavor-added marinated category for their Maui Secret Sicily. And Minnesota’s PastureLand Cooperative took home ribbons for its butter (2nd place salted, 3rd place unsalted). Technically Quebec beats out New York with 8 first place, 20 total — but last I checked Quebec was not actually a state. Two weeks ago I was thrilled to find my Saturday interrupted by an e-mail from Premier Cheese Market announcing that after three years on a waiting list, it had finally received its first shipment of Pholia Farm cheeses. Pholia Farm’s Elk Mountain cheese is on the Wine Spectator list, but I hadn’t been able to find it in Minneapolis up to that time, so I rushed over to the shop right after my son woke up from his nap and grabbed my wedge before someone else did. And I’m extremely glad I did! Ken let me sample all of the Pholia Farm goat’s-milk cheeses he had on hand, including the sumptuous Wimer Winter, but Elk Mountain was a stand-out as well. A raw-milk, aged cheese, its rind is washed with ale from the neighboring Wild River Brewery, and the Nigerian Dwarf goats are also fed the spent grain from the brewery, giving the cheeses a nutty, hoppy aroma and taste. Elk Mountain is a great snacking cheese – the cheesemaker recommends pairing it with fig and pear preserves – and is complemented by Viognier, Syrah, Champagne and full-bodied ales. Fun fact: Pholia Farm is located in the same Rogue River valley that is home to Rogue Creamery, one of Colleen’s favorite homestate cheesemakers. 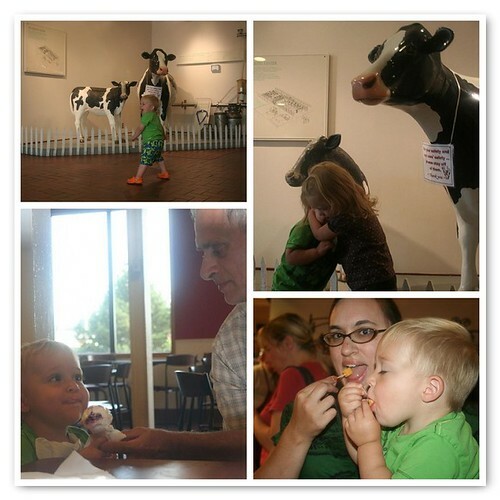 Do I predict an Oregon cheese crawl in our future? Does Cheese Make Matzah Taste Better? After noting the injustice of National Grilled Cheese Month overlapping with Passover, Colleen challenged me last week to make a matzah version of a grilled-cheese sandwich. I have made many matzah pizzas over the years, but I don’t believe matzah grilled cheese ever graced my plate before. Up to the task, I came home from a Heavy Table interview last night and decided to give it a shot. I broke a piece of matzah in half and inserted a slice of Tillamook medium aged cheddar (available at Costco in resealable bags and a fantastic substitute for American cheese singles) and got the sandwich going in my toaster oven. 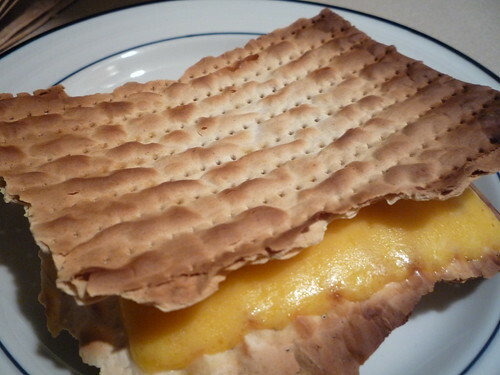 Just a few minutes later, the matzah became brown and the cheese was bubbling. The first taste consisted mostly of plain matzah and was blah as expected, but the second yielded a cheesy bite. But was it any good? Not really. The cheese was delicious, but the slightly charred matzah did nothing to enhance its flavor, and you really can’t compare bland matzah to the soft and tasty cushion that a piece of quality bread can provide. Luckily, Passover ends on Thursday night, so I can enjoy the rest of National Grilled Cheese Month as it’s meant to be – with the best bread I can find. Putting thoughts of the French countryside aside for now, I had the “rainy day blues” when I stopped into the cheesemonger to pick a cheese for this week. I chose the Crater Lake Blue from Oregon’s famed Rogue Creamery, one I usually overlook in favor of Rogue’s Smokey Blue, a personal favorite. The deeply blue-green veining of this cheese provides a lovely contrast to some fresh spring cheeses on a seasonal cheese board. Crater Lake Blue stays fairly firm as it comes to room temperature, so makes a fine snack with some of last year’s last pears. Or, melt a pat on top of a (local, grass-fed) steak for a decadent Sunday night treat. You can’t go wrong. 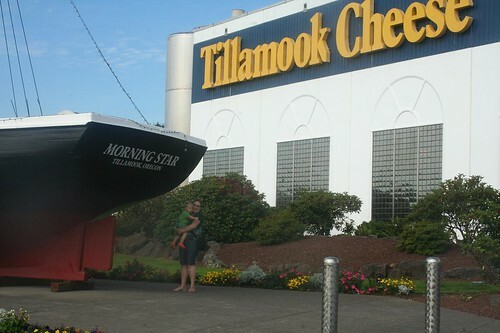 I grew up just over the mountains from Tillamook, Oregon, home to the Tillamook Cheese Factory. Crossing the coast range, the sight of dairy cows grazing in the valley – and their distinctive, uh, fragrance – was the first sign that we were nearly to the Coast. And of course, no visit to the Coast would be complete without a visit to the factory to watch the signature orange blocks of cheddar roll off the line, sample the curds and newest cheese varieties, and enjoy a giant scoop of fresh Tillamook ice cream in a waffle cone. (My favorite flavor is Marionberry Pie, closely followed by Mountain Huckleberry.) This past summer, we took my son for his first visit. He and my niece were facinated by the cheese bricks carried along conveyor belts, and didn’t complain about having to eat ice cream, either. A family tradition we’ll continue for many years!